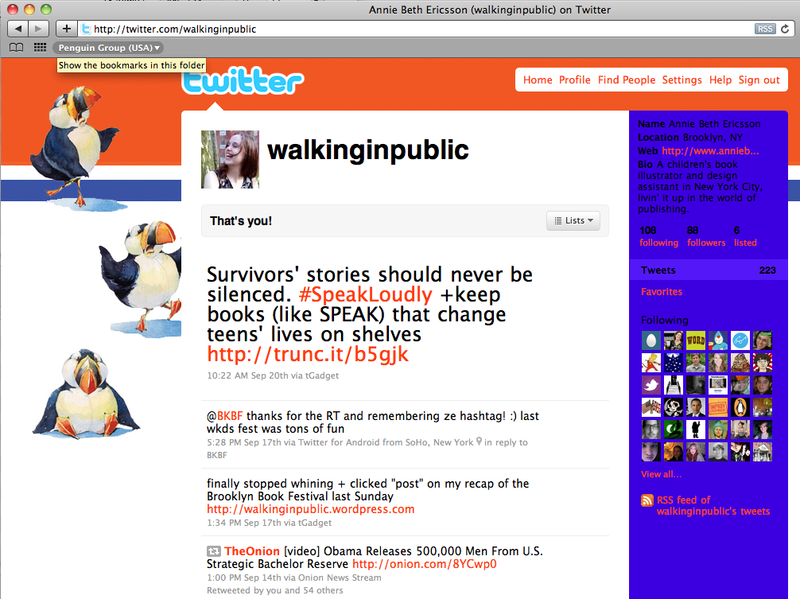 As my dear online stalkers will have noticed by now, Walking In Public and anniebethericsson.com have gotten a makeover! Web design has never really been my thing, and I’ve struggled in the past with trying to create a professional and consistent online presence that is also easy to update. Enter my hero, flavors.me! This new site allowed me to create a personalized custom website by embedding existing social media outlets (like WordPress, Twitter, and LinkedIn) into one hip, designed package. I’m loving this alternative to a Flash site because it’s not static – my work and online life is constantly changing and updating, and I need something that reflects all that I’m learning and doing, day by day, no coding included. 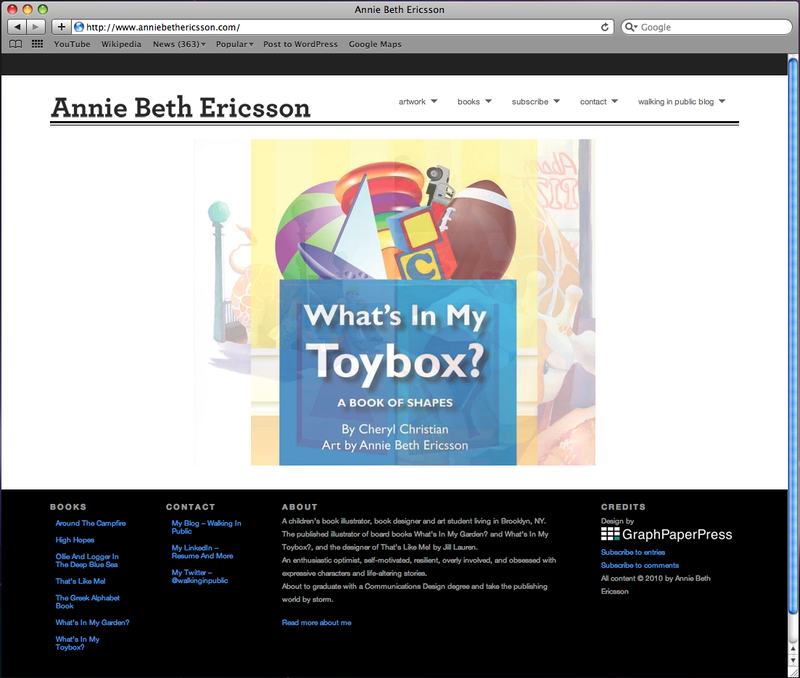 To complement my new look at anniebethericsson.com, I also freshened up my other sites to match. Since I can’t add content directly to flavors.me, I created a Tumblr blog simply for my illustration portfolio, but made it look similar to the home page (you can also view slideshows of more work on the Tumblr site that you can’t on flavors.me, so it’s worth checking out separately). And since the Walking In Public blog and Twitter design was outdated, I whipped up some new puffins MUCH more reflective of my current style. And . . . I just realized, that all I paint anymore is birds. Oops! Looks like website re-design is in the air . 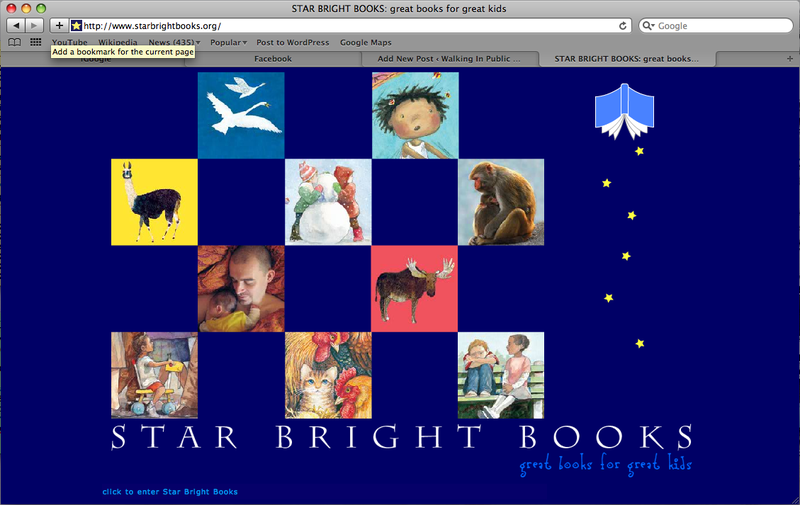 . . Star Bright Books, the Queens-based independent publisher behind What’s In My Toybox?, What’s In My Garden? 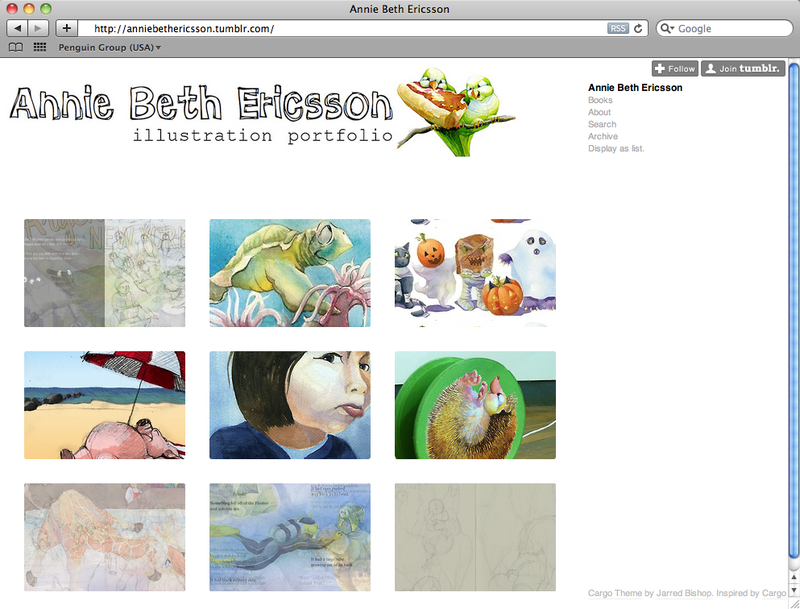 and That’s Like Me!, has a new site and it looks absolutely gorgeous. Best of all, you can order my books THERE instead (just click the links!). Much better than Amazon, which would only show the bilingual versions half the time. From Blog to Official WEBSITE Launch!! After a long night of pow-wowing and teaching each other WordPress over glasses of Merlot and the Olympics . . . This doesn’t AT ALL mean the end of Walking In Public. I’ll be here much more often, updating regularly with posts about my life as an illustrator, adventures in the entry-level publishing world, and other tidbits for bookworms. But for the “official” scoop on my work, previews of my books (some of which STILL need a good publisher home! 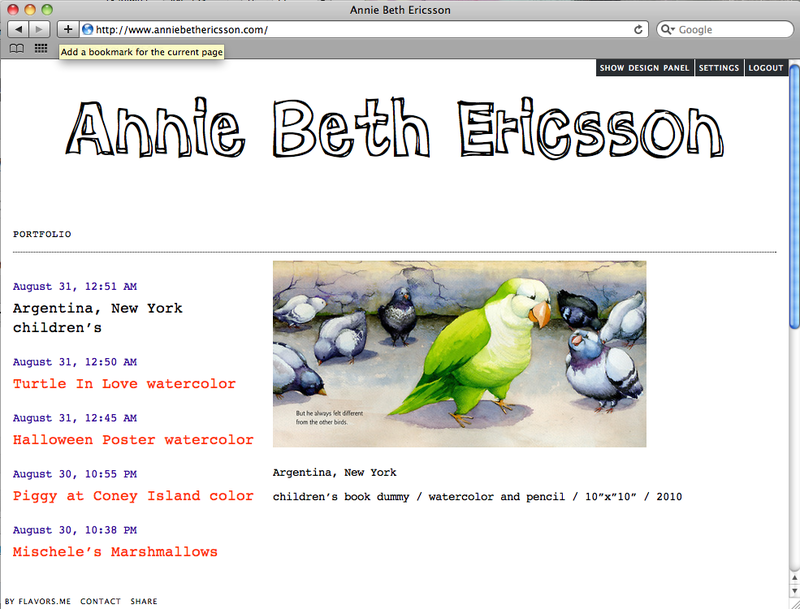 ), and all the info you can handle, run along over to anniebethericsson.com.